Amaranth - Can be made into porridge or cooked in a similar way as rice and eaten as a side. Buckwheat - flour can be used for making muffins or bread or pancakes. The whole grain is a great replacement for oats when making hot cereal. "Kasha" is toasted buckwheat and is good added with vegetables for a side or main dish. Chick pea/garbanzo bean flour - (Also called Gram flour, commonly used in east Indian cooking to make crispy bread called papadum). This flour is good for making quick flatbread in a skillet, similar to Italian polenta or French socca. Millet - (*High in protein) Can be eaten as porridge, used in stews and soups or as a mashed potato substitute. You can also sweeten millet with apples and honey to make dessert. Millet flour can be mixed with other flours to make bread. Oats - (*Although gluten free, some people with celiac are sensitive to oats.) Can be used to make oatmeal porridge or mixed with other flours to make muffins or bread. Rice - Rice has many varieties and is a very versatile grain. Brown rice is great in salads or pilafs. Rice noodles can be used in soups or stir fried with vegetables. Rice pasta can be used in place of wheat pasta. Rice paper can be used for making wraps or spring rolls. Wild rice or basmati rice make great main or side dishes. Medium grain rice is great for making sushi rolls or risotto. Short grain rice is good for desserts like rice pudding. Brown rice breads and tortillas are readily available and can be used in place of wheat breads. Rice cakes can be spread with nuts butter or used in place of crackers. Tapioca - Tapioca pearls can be used to make pudding. Tapioca flour can be used for baking muffins or bread. It gives baked good a chewy texture. Teff - (Comes in red, white or brown varieties and is a complete protein.) 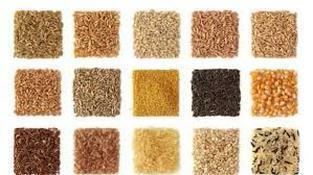 Teff grain can be used in place of rice or in a pilaf. It can also be added to onion and chopped veggies to make vegetarian patties. Teff flour can be used to make bread or pancakes and is traditionally used in Ethiopia to make a flatbread called Injera. Potatoes - Potatoes are so versatile! Eat themmashed, baked, hashed. Potatoes are great thickening agents in soups and stews. They are great in casseroles, salads, or baked. Sweet Potatoes/Yams - They can be used in a wide variety of dishes, both savory and sweet, and pair well with cinnamon, honey, lime, ginger, coconut and nutmeg. Enjoy them in desserts, breads and muffins, puddings and custards, casseroles, stews or croquettes or in place of white potatoes. Sorghum - This is a cereal grain also called milo or jawar. The sweet sorghum flour is used most commonly to make gluten free breads and muffins.